Sagi Chocolate Display Cabinet Luxor Black KC8QAAbout the CompanySAGI Spa has been a leader in the field of professional refrigeration equipment for over 30 years. The company designs, manufactures and markets refrigerators, refrigerated counters, blast chiller/freezers, refrigerated pizza tables, refrigerated display units, and much more.Sagi Spa part of Marmon Food, Beverage & Water Technologies, the US holding company Berkshire Hathaway Inc, and operates worldwide.The Sagi Spa Upright Pastry Displays are suitable for cafe's, patisserie & pastry shop, bakeries, chocolatiers, confectionery and retails. If you are looking for top quality Pastry Display Cabinet which will add more value to your establishment, Cool Expert offers an extensive range of pastry display counters to choose from. Our patisserie and cake display fridges are the ultimate combination of style and functionality and are ideal for displaying chocolate, pastry & pattiserie, and bakery products as well as confectionery, artisan and classic pies. The counters are top of the range and we pride ourselves with our competitive price on our dessert and cake display case, in the UKTECHNICAL DETAILS PDF BROCHURE PDF The Luxor New Colours series of refrigerated display cabinets for bars, confectioner's shops,ice cream parlours, and restaurants renders every environment even more special and unique, while at the same time providing every product on display with the exclusivity it deserves by offering the selection of three different colours (White, Black and Silver), all of which come complete with high luminosity LED lighting bars and capacitive control boards.Available in 3 versions:· White· Silver· BlackLuxor BlackDisplay compartment in tempered glass with black screen-printed glass.Lower structure in special black polished steel, complete with a capacitive control panel with HACCP Alarms. High luminosity LED bar lighting on the front panel, on the back of the door, and the on internal ceiling element in the display compartment.The value of the detailsDesigned to combine structural elegance with maximum display quality, the Luxor Black refrigerated display case transforms the display area into a captivating and high-impact showroom.The all-black style creates a refined and mysterious effect that's capable of enticing customers to try out new products and flavours. The materials' glossy finish is matched and completed with LED lighting inside the display compartment, which is designed to ensure exceptionally high levels of brightness, thus creating a unique, and captivating effect.EFFICIENCY: The luxury of performance and reliabilityDesigned to guarantee the optimal preservation of the products on display, the Luxor White boasts a perfect balance of design and refrigeration technology: the quality of this all-Italian product achieves levels of absolute excellence thanks to the experience and attention to detail that have always characterised products made in Sagi.The refrigeration systems of the various models are designed to offer maximum performance for every kind of product on display.The shelf positioning, the door–stop system, and the electronic control panel with HACCP alarm signals represent maximum expressions of quality and functionality, all of which are meticulously designed, for a refrigerated display unit of the latest generation.EXTRA VALUE: To increase salesWith its different sizes and colours, Luxor has the magic ability to multiply the value of displayed goods, with the aim of increasing sales. Customers are carried away with temptations offered by elegant, bright displays that stimulate their desire to indulge in pleasurable, special, tasty treats.With Luxor, dreams becomes reality!.. Sagi Chocolate Display Cabinet Luxor KC8QAbout the CompanySAGI Spa has been a leader in the field of professional refrigeration equipment for over 30 years. The company designs, manufactures and markets refrigerators, refrigerated counters, blast chiller/freezers, refrigerated pizza tables, refrigerated display units, and much more.Sagi Spa part of Marmon Food, Beverage & Water Technologies, the US holding company Berkshire Hathaway Inc, and operates worldwide.The Sagi Spa Upright Pastry Displays are suitable for cafe's, patisserie & pastry shop, bakeries, chocolatiers, confectionery and retails. If you are looking for top quality Pastry Display Cabinet which will add more value to your establishment, Cool Expert offers an extensive range of pastry display counters to choose from. Our patisserie display fridges are the ultimate combination of style and functionality and are ideal for displaying pastry and bakery products as well as confectionery, artisan and classic pies. The counters are top of the range and we pride ourselves with our competitive price on our dessert and cake display case, in the UKTECHNICAL DETAILS PDF BROCHURE PDF With its meticulous attention to detail, exclusive features, and design developed in collaboration with MASSIMOMUSSAPI®, the Luxor is the upright refrigerated display unit that everyone has been waiting for. Boasting an elegant, innovative, and fully-adaptable design, this cutting-edge unit is entirely unique, and ranks at the top of its category. The decisive and elegant contours are an expression of the personality and charm that have rendered the Luxor upright refrigerated display unit ideal for bars, confectioner's shops, ice cream parlour, and restaurants, and perfect for anyone who wants to engage and stimulate their clientele. Essential design, suitable for any environment.Thanks to their essential contours, harmonious proportions, and neutral colours and lighting, the Luxor models represent a true revolution in the field of upright refrigerated display units.The essential design features a display compartment made entirely from grey tempered glass, and a smudge-proof steel lower structure that masterfully hides the wheels, thus giving the Luxor models a sleek and lightweight feel.Combined with the innovative shelf support system and “invisible” integrated handle, the structure's dimensions drastically increase the display space and optimise visibility on every level.The LED lighting creates a luminous and inviting ambience. HIGH-QUALITY DISPLAY: Luxury and functionalityLuxor's range of refrigerated display units are designed to meet every display requirement. Ideal for bars, confectioner's shops, ice cream parlours, and restaurants, as well as any other consumer environment outside the home.The various models of professional refrigerators are designed to offer maximum reliability and performance for every kind of product on display.The shelf positioning, the door–stop system, and the HACCP control panel represent maximum expressions of quality and functionality, all of which are meticulously designed, for a refrigerated display unit of the latest generation. EXTRA VALUE: To increase salesWith its different sizes and colours, Luxor has the magic ability to multiply the value of displayed goods, with the aim of increasing sales. Customers are carried away with temptations offered by elegant, bright displays that stimulate their desire to indulge in pleasurable, special, tasty treats. With Luxor, dreams become reality! ..
Sagi Chocolate Display Cabinet Luxor Slim KC6QAbout the CompanySAGI Spa has been a leader in the field of professional refrigeration equipment for over 30 years. The company designs, manufactures and markets refrigerators, refrigerated counters, blast chiller/freezers, refrigerated pizza tables, refrigerated display units, and much more.Sagi Spa part of Marmon Food, Beverage & Water Technologies, the US holding company Berkshire Hathaway Inc, and operates worldwide.The Sagi Spa Upright Pastry Displays are suitable for cafe's, patisserie & pastry shop, bakeries, chocolatiers, confectionery and retails. If you are looking for top quality Pastry Display Cabinet which will add more value to your establishment, Cool Expert offers an extensive range of pastry display counters to choose from. Our patisserie display fridges are the ultimate combination of style and functionality and are ideal for displaying pastry and bakery products as well as confectionery, artisan and classic pies. The counters are top of the range and we pride ourselves with our competitive price on our dessert and cake display case, in the UKTECHNICAL DETAILS pdf.BROCHURE pdf. With its meticulous attention to detail, exclusive features, and design developed in collaboration with MASSIMOMUSSAPI®, the Luxor is the upright refrigerated display unit that everyone has been waiting for. Boasting an elegant, innovative, and fully-adaptable design, this cutting-edge unit is entirely unique, and ranks at the top of its category.The decisive and elegant contours are an expression of the personality and charm that have rendered the Luxor upright refrigerated display unit ideal for bars, confectioner's shops, ice cream parlour, and restaurants, and perfect for anyone who wants to engage and stimulate their clientele. Essential design, suitable for any environment.Thanks to their essential contours, harmonious proportions, and neutral colours and lighting, the Luxor models represent a true revolution in the field of upright refrigerated display units.The essential design features a display compartment made entirely from grey tempered glass, and a smudge-proof steel lower structure that masterfully hides the wheels, thus giving the Luxor models a sleek and lightweight feel.Combined with the innovative shelf support system and “invisible” integrated handle, the structure's dimensions drastically increase the display space and optimise visibility on every level. The LED lighting creates a luminous and inviting ambience. HIGH-QUALITY DISPLAY: Luxury and functionality Luxor's range of refrigerated display units are designed to meet every display requirement. Ideal for bars, confectioner's shops, ice cream parlours, and restaurants, as well as any other consumer environment outside the home.The various models of professional refrigerators are designed to offer maximum reliability and performance for every kind of product on display.The shelf positioning, the door–stop system, and the HACCP control panel represent maximum expressions of quality and functionality, all of which are meticulously designed, for a refrigerated display unit of the latest generation. EXTRA VALUE: To increase salesWith its different sizes and colours, Luxor has the magic ability to multiply the value of displayed goods, with the aim of increasing sales. Customers are carried away with temptations offered by elegant, bright displays that stimulate their desire to indulge in pleasurable, special, tasty treats. With Luxor, dreams become reality! ..
Sagi Chocolate Display Cabinet Luxor White KC8QVLUXOR NEW COLORSAbout the CompanySAGI Spa has been a leader in the field of professional refrigeration equipment for over 30 years. The company designs, manufactures and markets refrigerators, refrigerated counters, blast chiller/freezers, refrigerated pizza tables, refrigerated display units, and much more.Sagi Spa part of Marmon Food, Beverage & Water Technologies, the US holding company Berkshire Hathaway Inc, and operates worldwide.The Sagi Spa Upright Pastry Displays are suitable for cafe's, patisserie & pastry shop, bakeries, chocolatiers, confectionery and retails. If you are looking for top quality Pastry Display Cabinet which will add more value to your establishment, Cool Expert offers an extensive range of pastry display counters to choose from. Our patisserie display fridges are the ultimate combination of style and functionality and are ideal for displaying pastry and bakery products as well as confectionery, artisan and classic pies. The counters are top of the range and we pride ourselves with our competitive price on our dessert and cake display case, in the UKTECHNICAL DETAILS PDF BROCHURE PDF The Luxor New Colours series of refrigerated display cabinets for bars, confectioner's shops, ice cream parlours, and restaurants, renders every environment even more special and unique, while at the same time providing every product on display with the exclusivity it deserves by offering the selection of three different colours (White, Black and Silver), all of which come complete with high luminosity LED lighting bars and capacitive control boards. Available in 3 versions:· White· Silver· Black LUXOR WHITE - LUXOR WHITE SLIMDisplay compartment in tempered glass with white screen-printed glass. With special extra-clear tempered glass on the positive temperature models.Lower structure in extra-clear white glass, complete with an integrated capacitive control panel with HACCP Alarms.High luminosity LED bar lighting on the front panel, on the back of the door, and the on internal ceiling element in thedisplay compartment. Luxor White Slim designed for those who have little space available or want to diversify their display environments, while at the same time fully exalting the products on display. NEW VISIONS: The secret of temptation With its refined and minimalist design, the Luxor White is an upright display unit that's perfect for bringing the products on display to life and is even capable of adapting to any environment with simple elegance.The pure white on extra-clear glass of the display compartment and the lower structure creates a clean, harmonious, and fully-engaging effect, leaving room only for temptation! The materials' glossy finish is matched and completed with LED lighting inside the display compartment, which is designed to ensure exceptionally high levels of brightness, thus creating a unique, and captivating effect. EFFICIENCY: The luxury of performance and reliabilityDesigned to guarantee the optimal preservation of the products on display, the Luxor White boasts a perfect balance of design and refrigeration technology: the quality of this all-Italian product achieves levels of absolute excellence thanks to the experience and attention to detail that have always characterised products made in Sagi. The refrigeration systems of the various models are designed to offer maximum performance for every kind of product on display.The shelf positioning, the door–stop system, and the electronic control panel with HACCP alarm signals represent maximum expressions of quality and functionality, all of which are meticulously designed, for a refrigerated display unit of the latest generation. EXTRA VALUE: To increase salesWith its different sizes and colours, Luxor has the magic ability to multiply the value of displayed goods, with the aim of increasing sales. Customers are carried away with temptations offered by elegant, bright displays that stimulate their desire to indulge in pleasurable, special, tasty treats. With Luxor, dreams become reality! 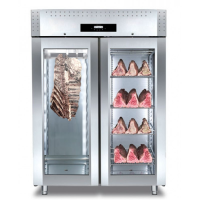 ..
Sagi Chocolate Display Cabinet Slim White KC6QVAbout the CompanySAGI Spa has been a leader in the field of professional refrigeration equipment for over 30 years. The company designs, manufactures and markets refrigerators, refrigerated counters, blast chiller/freezers, refrigerated pizza tables, refrigerated display units, and much more.Sagi Spa part of Marmon Food, Beverage & Water Technologies, the US holding company Berkshire Hathaway Inc, and operates worldwide.The Sagi Spa Upright Pastry Displays are suitable for cafe's, patisserie & pastry shop, bakeries, chocolatiers, confectionery and retails. If you are looking for top quality Pastry Display Cabinet which will add more value to your establishment, Cool Expert offers an extensive range of pastry display counters to choose from. Our patisserie display fridges are the ultimate combination of style and functionality and are ideal for displaying pastry and bakery products as well as confectionery, artisan and classic pies. The counters are top of the range and we pride ourselves with our competitive price on our dessert and cake display case, in the UKTECHNICAL DETAILS PDF BROCHURE PDF The Luxor New Colours series of refrigerated display cabinets for bars, confectioner's shops, ice cream parlours, and restaurants renders every environment even more special and unique, while at the same time providing every product on display with the exclusivity it deserves by offering the selection of three different colours (White, Black and Silver), all of which come complete with high luminosity LED lighting bars and capacitive control boards.Available in 3 versions:· White· Silver· Black LUXOR WHITE - LUXOR WHITE SLIMDisplay compartment in tempered glass with white screen-printed glass. With special extra-clear tempered glass on the positive temperature models.Lower structure in extra-clear white glass, complete with an integrated capacitive control panel with HACCP Alarms.High luminosity LED bar lighting on the front panel, on the back of the door, and the on internal ceiling element in the display compartment. Luxor White Slim designed for those who have little space available or want to diversify their display environments, while at the same time fully exalting theproducts on display. NEW VISIONS: The secret of temptation With its refined and minimalist design, the Luxor White is an upright display unit that's perfect for bringing the products on display to life, and is even capable of adapting to any environment with simple elegance.The pure white on extra-clear glass of the display compartment and the lower structure creates a clean, harmonious, and fully-engaging effect, leaving room only for temptation!The materials' glossy finish is matched and completed with LED lighting inside the display compartment, which is designed to ensure exceptionally high levels of brightness, thus creating a unique, and captivating effect. EFFICIENCY: The luxury of performance and reliabilityDesigned to guarantee the optimal preservation of the products on display, the Luxor White boasts a perfect balance of design and refrigeration technology: the quality of this all-Italian product achieves levels of absolute excellence thanks to the experience and attention to detail that have always characterised products made in Sagi.The refrigeration systems of the various models are designed to offer maximum performance for every kind of product on display.The shelf positioning, the door–stop system, and the electronic control panel with HACCP alarm signals represent maximum expressions of quality and functionality, all of which are meticulously designed, for a refrigerated display unit of the latest generation. EXTRA VALUE: To increase sales With its different sizes and colours, Luxor has the magic ability to multiply the value of displayed goods, with the aim of increasing sales. Customers are carried away with temptations offered by elegant, bright displays that stimulate their desire to indulge in pleasurable, special, tasty treats. With Luxor, dreams become reality! ..